If you want to use the Lightbend platform to create highly performant reactive applications, then this book is for you. If you are a Scala developer looking for techniques to use all features of the new Akka release and want to incorporate these solutions in your current or new projects, then this book is for you. Expert Java developers who want to build scalable, concurrent, and reactive application will find this book helpful. For a programmer, writing multi-threaded applications is critical as it is important to break large tasks into smaller ones and run them simultaneously. Akka is a distributed computing toolkit that uses the abstraction of the Actor model, enabling developers to build correct, concurrent, and distributed applications using Java and Scala with ease. The book begins with a quick introduction that simplifies concurrent programming with actors. We then proceed to master all aspects of domain-driven design. 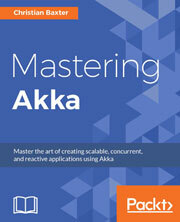 We&apos;ll teach you how to scale out with Akka Remoting/Clustering. Finally, we introduce Conductr as a means to deploy to and manage microservices across a cluster. This comprehensive, fast-paced guide is packed with several real-world use cases that will help you understand concepts, issues, and resolutions while using Akka to create highly performant, scalable, and concurrency-proof reactive applications.